Five hundred yards northwest of this marker stood the Bonneville Cabins, built by Captain B.L.E. Bonneville in 1835 to store his trade goods. Three cabins were constructed and later two more. 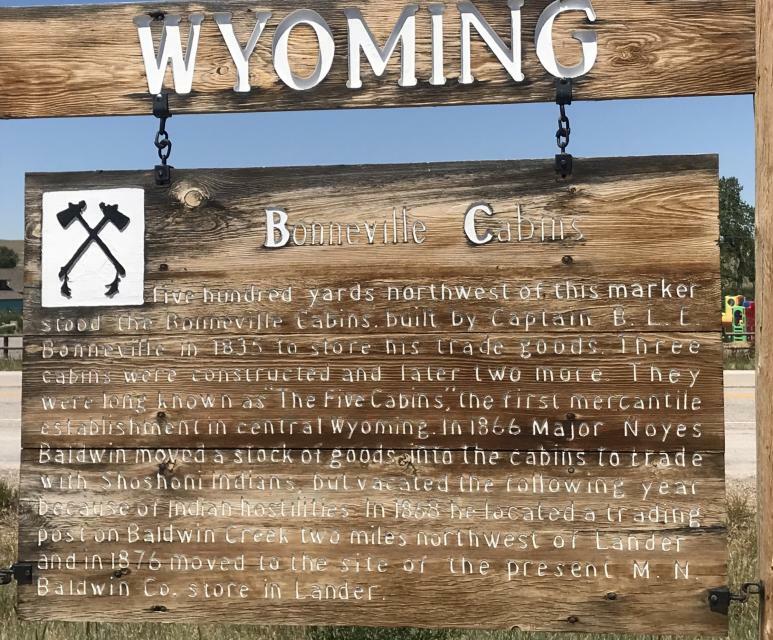 They were long known as "The Five Cabins, : the first mercantile establishment in central Wyoming. In 1866 Major Noyes Baldwin moved a stock of goods into the cabins to trade with Shoshoni Indians, but vacated the following year because of Indian hostilities. In 1868 he located a trading post on Baldwin Creek two miles northwest of Lander and in 1876 moved to the site of the present M.M. Baldwin Co. store in Lander. This marker can also be identified by its HM code. You can use the hashtag #HM1IQA in tweets, and any other place where you might refer to this marker, including when searching on this site.